Mayland Heights, Belfast and Vista Heights residents are actively engaged in their community and keeping them informed is our top-priority. 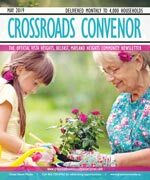 Crossroads Convenor is the official community newsletter, and covers community news and is published monthly to keep content current and relevant. Delivered to every household, apartment, and business, every resident is acquainted with the community’s most important information. The Crossroads community association is very active within the community. As a reflection of this older neighbourhood, the community’s Fifty Plus Club is very active, engaging in tours, potlucks, and dinner theatre activities. The community also holds several fundraising bingos each year. For the younger set, the Crossroads preschool is very popular. Girl Guides, Boy Scouts and Blockwatch all make use of the community centre for meetings. Crossroads offers a number of courses as well, in activities ranging from crafts to soccer and babysitting to parent and tot time. Special events are popular in Crossroads as well, and their annual Stampede breakfast is always a big hit. In the City of Calgary’s 2012 municipal census, Vista Heights had a population of 2,204 living in 844 dwellings, a -3.1% increase from its 2011 population of 2,274. With a land area of 1.1 km2 (0.42 sq mi), it had a population density of 2,000/km2 (5,190/sq mi) in 2012. Residents in this community had a median household income of $51,370 in 2000, and there were 25.4% low income residents living in the neighborhood. As of 2000, 18.6% of the residents were immigrants. Most buildings were single-family detached homes and row houses, and 47% of the housing was used for renting. For more detailed info visit the City of Calgary community profiles site.